China’s manufacturing sector has experienced a drop for the first time in three years, largely because of lower export demand from both Europe and the US. This has prompted a monetary stimulus policy in China, and–at the same time–many banks internationally are providing stimulus as well, propping-up stock markets everywhere. The emergency move by the U.S. Federal Reserve, the European Central Bank, and the central banks of Japan, Britain, Canada and Switzerland recalled coordinated action to stabilize global markets in the 2008 financial crisis after the collapse of Lehman Brothers. In Italy, now the focal point of the euro debt crisis, the Treasury started emergency cash tenders for banks which have been squeezed particularly hard as Rome’s borrowing costs have soared towards 8 percent, a level seen as unaffordable in the long term. The euro and European shares surged on the central bank action, which came after euro zone finance ministers agreed to ramp up the firepower of their bailout fund but acknowledged they may have to turn to the International Monetary Fund for more help. These actions will lower the cost of borrowing, and that will be welcome both by deficit spending governments and industry, but for long-term help, there must also be a willingness to borrow and spend. There may be a factor here that is not being given enough attention. We are in a world where we have experienced a great deal of new investment and consumer spending on personal computers, mobile phones, and the growth of new industries spawned by those technologies. It is natural that at the tail-end of those developments we will witness less investment spending and a slow-down in consumption. U.S. Federal Reserve Chairman Ben Bernanke is scheduled to testify before the Senate Banking Committee today, and this report gives a helpful glimpse at the difficulties he faces. We learned in the 1970’s, when OPEC first managed to raise oil prices, about the double-edged sword of stagflation. Oil has become such a strong supply side influence that it can cause both inflation and slow economic growth. Bernanke wants to maintain the Fed’s 600 million stimulus package to battle low growth rates and unemployment that is still around 9% in the U.S. The problem is that many Americans–and many in Congress–are afraid of inflation and the large public debt in the states. It is a dilemma, but with inflation at only 0.8% over the last year, I agree that Bernanke is emphasizing the correct problem, despite higher oil prices. The time to fight inflation and deficits is when we see strong growth. On the other hand, perhaps the American economy has reached income levels where more growth should not be emphasized. 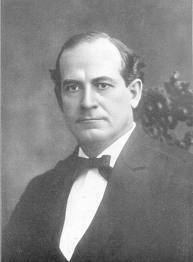 william jennings bryan was a policy maker worth emulating? now? Never have I heard that William Jennings Bryan was promoting monetarist policy long before Milton Friedman and Anna Schwartz published their ideas. This article claims that Bryan promoted and practiced monetary policy in fighting the US recession of 1893, predating the birth of formal monetarist economics by about 60 years. Yet – as Bryan argued in 1896 – inflation is what we need. 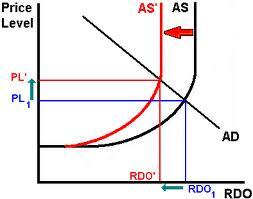 In an inflation, debts gradually melt, and depressed assets like houses begin to recover their value relative to cash. Defenders of the administration argue that there is nothing more that the Federal Reserve can do — that it has already cut interest rates to zero, that monetary policy is exhausted. But there’s always more that monetary policy can do! As Milton Friedman famously proposed back in 1968, when all else fails, the monetary authorities can print money, load it into helicopters, and drop cash over the landscape. That’s stimulating! It is also argued that money growth is a natural way to battle deflation, but–despite the observation of cheaper housing–I do not think the data backs-up the deflation argument. This story–China’s growth accelerates to 10.7 percent in 4Q–creates some curious reactions in world markets. Asian stock indexes went down, and the US dollar rose to a five-year high. The funny part is that the good news also brought renewed expectations that China would raise interest rates and tighten money supply growth. Inflation is feared, apparantly more than a reduction in the rate of growth. Strong Chinese growth could help to drive a global recovery by boosting demand for foreign oil, consumer goods and other imports. 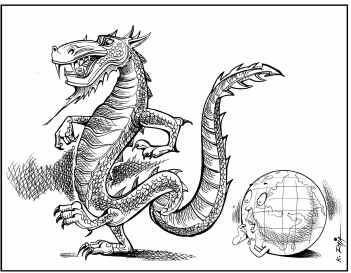 It also might give Beijing confidence to ease currency controls and allow its yuan to rise against the dollar, which could boost imports by making them cheaper for its consumers. China has kept the yuan steady against the dollar since late 2008 to keep its exporters competitive abroad. But that progress could be derailed if a burst of inflation saps the spending power of Chinese families and forces the government to clamp down so severely on credit and investment that it slows the creation of new jobs. So the expected increase in interest rates explains the lower spending expectations in the rest of Asia, but that would normally make the currency stronger against the dollar. Must be that the “confidence to ease currency controls,” is seen as a stronger influence. Myself? I doubt it. For years China has been able to keep the Yuan relatively low through currency purchases, and still manage inflation domestically. Like mentioned later in the article, most of China is still a developing country. This article claims that Ben Bernanke has probably been reappointed chairman of the Federal Reserve. 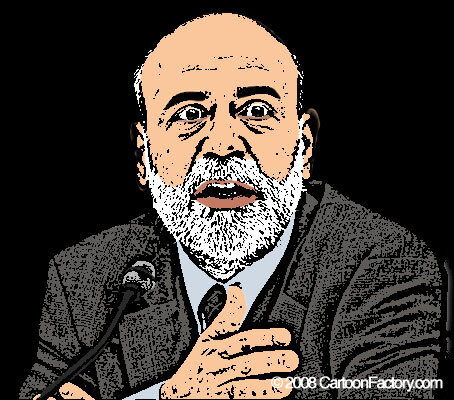 However, the article’s real topic–the real argument–is that Bernanke and the Fed. are the most likely source of meaningful help for the economic downturn. As my students will recognize, this is a very monetarist argument, dependent finally on the Quantity Theory of Money, where money supplies are the final determinant of production. Another perspective (Keynesian) might argue that monetary policy is ineffective if people are unwilling to borrow even at low interest rates. The following bit suggests that the Fed. recognizes this as a problem, but not much of an argument that these problems can be overcome. He has ordered the Fed’s bank examiners to muscle banks into boosting their lending. This often requires an examiner to tell a bank that it should value a property used as collateral higher than it may want to. The Fed is also reviving the market for the bundling of loans for small businesses. And it is bending the arms of potential investors to put more capital into banks to increase credit. A good editorial here about monetary policy, focused on the Federal Reserve and how it has dealt with the recession. Some valid criticisms here–rewards for the “imprudent financial firms at the expense of their more prudent rivals,” and a recent policy reversal that is poorly timed. Then the amusing bit, critiqueing Bernanke’s claim that the recession was nearly over. One doesn’t usually turn to old TV shows for economic insights. Yet the best way to put the Fed’s role in the recent crisis in perspective is by recalling an episode of “The Beverly Hillbillies” – the one in which Granny convinces everyone that a spoonful of her medicine can cure the common cold. Sure enough, it can: It just takes between a week and 10 days. I like the mataphor. The message–of course–is that recessions are self-curing too, and Bernanke and money policy do not deserve credit for a recovery. Expansionist monetary policy, but I did not know it was not commonly used. The Fed surprised investors on Wednesday by announcing it would buy $300 billion worth of these U.S. Treasuries for the first time since the early 1960s as part of a move to inject an additional $1 trillion into the U.S. economy by also purchasing more U.S. mortgage and agency debt. The news spawned higher demand for Asian securities and sent the value of the dollar into free-fall. The plan is meant to feed into the economy by lowering borrowing costs and attracting investors back to work. It seems to have spurred some optimism, which is good in itsself, but I don’t know if it will work. Will the sellers of these securities turn around and spend the cash? Or find someone who wants to borrow it?